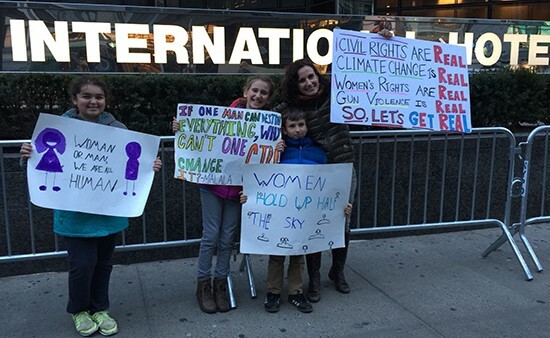 On Saturday, January 21, my family participated in the New York City and Hartford versions of the global marches for women (and not just for women!). While my wife and our daughter headed to New York via train with a large contingent of fellow New Haveners, our son and I went to Hartford in the afternoon. The night before, friends gathered, with the younger set crafting homemade posters. 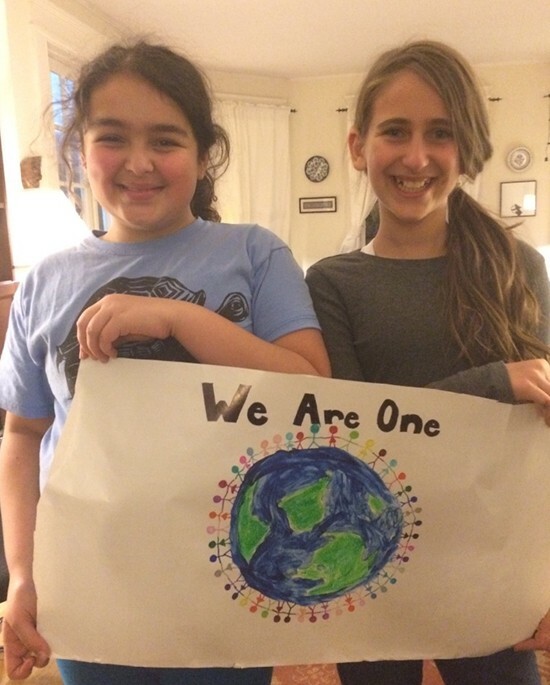 The daughters, respectively, of an immigrant from India who is Muslim and of an immigrant from Ukraine who is Jewish. In Hartford, we saw a former New Haven mayoral candidate with his family, as well as a current public school principal with his. 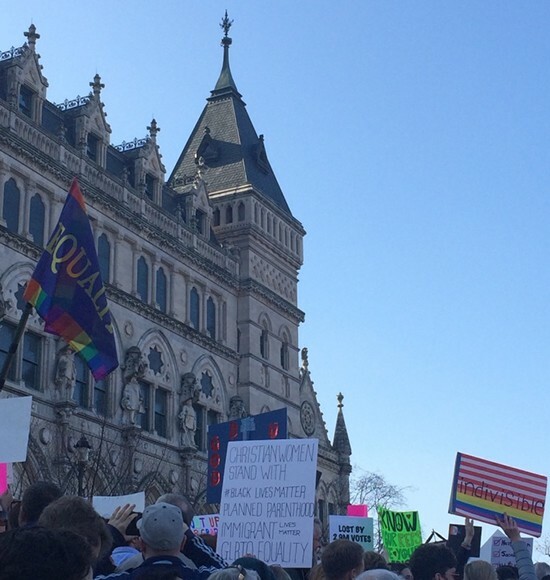 We were among a crowd estimated at some 10,000 by the State Capitol in Bushnell Park. Though my son and I were too far back to get clear views of the speakers (Gov. Dannel Malloy, Comptroller Kevin Lembo, and legislator Beth Bye among others), their remarks were just part of the occasion. Music and chants — especially “Love trumps hate!” — resounded. I struck up brief conversations with several participants, including a couple appearing in their sixties from Windsor, and two women — from Middletown and Wethersfield — of a similar age. 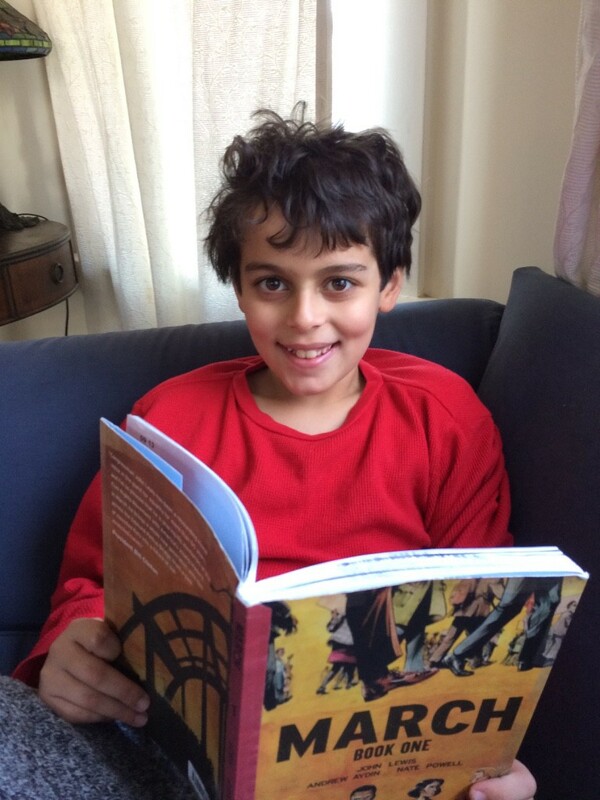 There were other children roughly my son’s age (nine), as well as numerous twenty- and thirty-somethings. Several evidently identified as transgender, perhaps eighty-odd percent female, and the rest male. There was a spirit of camaraderie, emboldened by the scores of handmade posters. Beyond the snapshots here, the Hartford Courant has professional photography of the event. 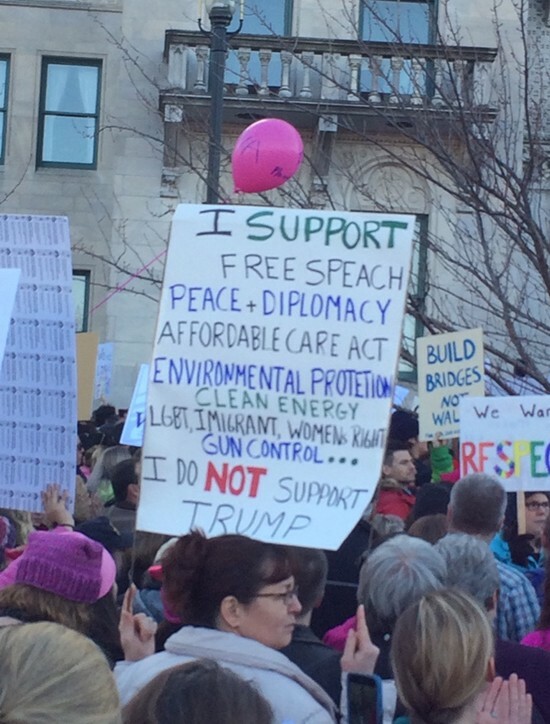 Some signs were earnest, listing specific examples of policy concerns. Others were targeted toward a particular issue or two — including those of understandably profound consideration for women and their bodies. Many voiced positive messages of unity and humanity. My son’s poster captured a sentiment to which we all can aspire. His marching had been inspired in part by our having together (over the MLK holiday weekend) read book one of the John Lewis March trilogy. This was as a dispute developed between Congressman Lewis, a civil rights hero, and the not-yet-president. 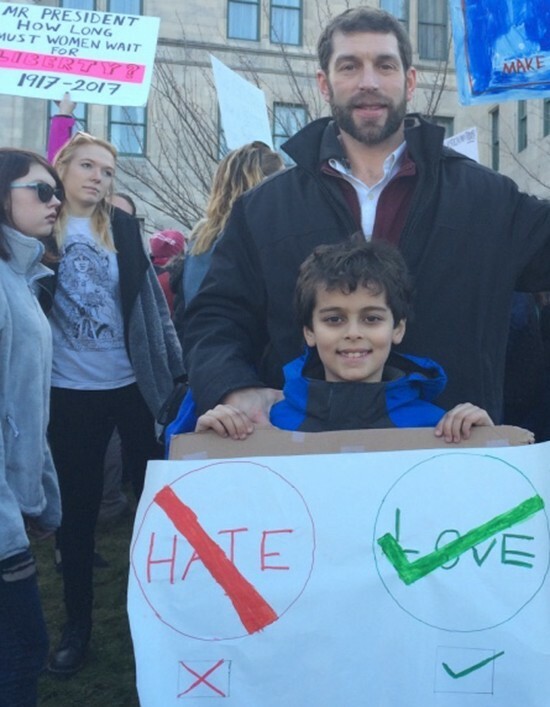 In addition, my son had followed his mom’s mobilization as a new U.S. citizen and voter in 2016 (and now protester in 2017). He had also heard of his grandfather’s (my father’s) participation in the 1963 March on Washington, where as a CORE volunteer he heard John Lewis and Dr. King himself speak. Meanwhile, in New York, hundreds of thousands (an estimated 400,000 people) marched from the UN to Trump Tower. Expecting throngs, the organizers asked participants to obtain tickets (at no charge) in advance. 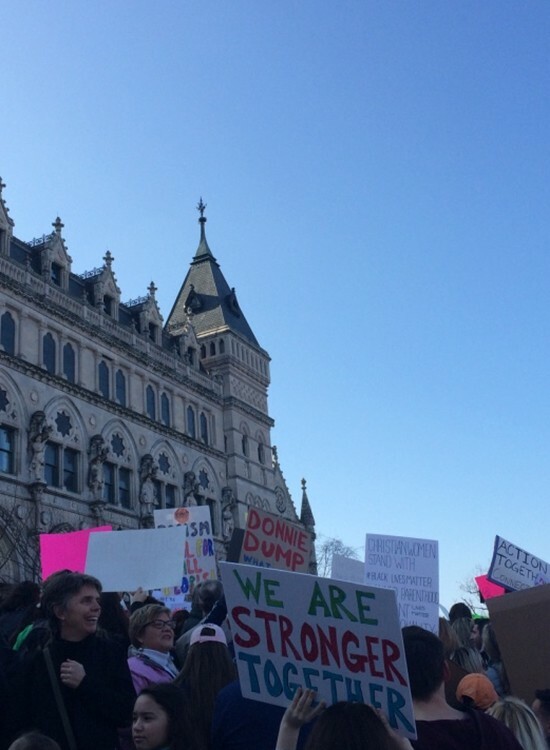 After completing that march, my wife, our daughter, and friends walked to the Trump International Hotel, too. Their signs included quotations from Malala Yousafzai. Young and not-as-young, the marchers in various cities seized the opportunity to assume what President Obama in his January 10 farewell address termed “the most important office in a democracy”: citizen.